The Yorktown Civic Association recognizes the critical importance of Greenbrier Park to Yorktown High School sports and to Arlington residents in nearby neighborhoods, and would like to see the park’s redevelopment serve the best interests of these populations. YCA also supports Arlington County recreational activities in the park to the extent that usage is appropriate for this limited-sized facility located adjacent to many Arlington family homes and to the extent that such usage does not adversely impact Yorktown High School and the local neighborhood. The neighborhood is very concerned that planned renovations at Greenbrier Park will result in a significant expansion of park usage, and therefore park usage hours must be clearly established and posted. No sporting events or organized practices should be scheduled prior to 9 a.m. on weekends, and all games and practices must end by 10:30 p.m. or earlier 7 days per week. No P.A. system use should occur prior to Noon. Synthetic turf should not be installed in the lower field area. If synthetic turf is to be installed on the competition field, it is imperative that hours of use be limited as described above. 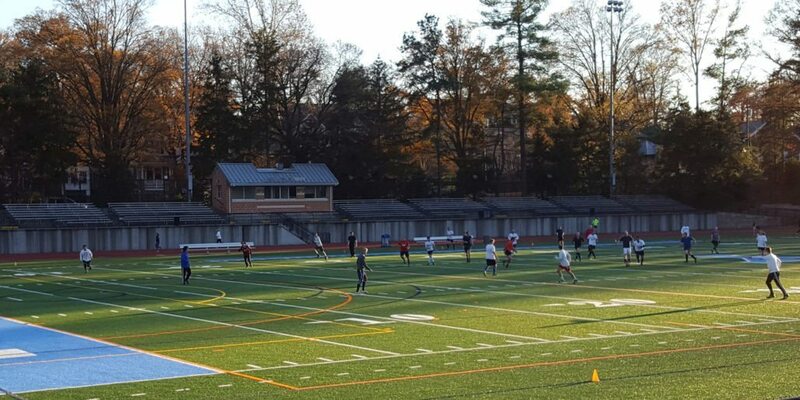 The master plan anticipated that the lower-field parking area would not be removed until additional parking is made available as part of phase-II Yorktown High remodeling. Existing off-street parking must not be diminished during or after redevelopment of the park. The neighborhood continues to have concerns about the parking arrangement proposed in the master plan, especially during larger events. Scheduling of the park renovations must anticipate other space/location needs that may arise as part of the phase-II Yorktown remodeling. Several school construction-related issues were not addressed in the park master plan. For example, will any of the lower field area be needed for temporary classrooms or school construction staging? What is the likely replacement timeframe and design of the existing swimming pool building? Extensive attention must be devoted to the following areas in order to reduce negative impacts on nearby residents: drainage, field lighting, and the sound system. Drainage from the fields has been a major problem for residents living north of the park (on Greencastle St.). A two-tiered lighting system should be installed that offers lower lighting during non-game periods of park use. The sound system must allow adequate quality and control to prevent noise spillage into the surrounding neighborhood. Significant improvements to the existing buffer are needed. Likewise, if any existing trees are to be removed, it is expected that the County adheres to its own tree replacement policy. The design, location and construction materials of the new bleachers should take into account the impact of noise and lighting on the neighborhood. For example, the ability to maintain and keep the bleacher area clean and free of trash should be a priority. Also, the noise and lighting impact may be less if the home team bleachers are moved to the north side of the competition field. Consideration should be given to moving the track straight-of-way to the north side of the track to provide some noise reduction for nearby neighbors. The chain link fence should be replaced with materials that fit with the appearance of the new school addition and with the homes in the neighborhood, possibly using materials such as brick and wrought iron. Given the number of neighborhood residents currently using the track for walking and daily exercise, residents are concerned that there will be a reduction of access to the track during sporting events. Consideration should be given to designing a walking trail for the park to offset this potential denial of access. The design should include replacement of the sidewalk on the east side of the park along Greenbrier Street. It currently has a dangerous drop-off to the parking area below. The entrance and exit to the football field should remain at the northeast corner of the field, closest to the off-street parking area, given the proposed parking plan.